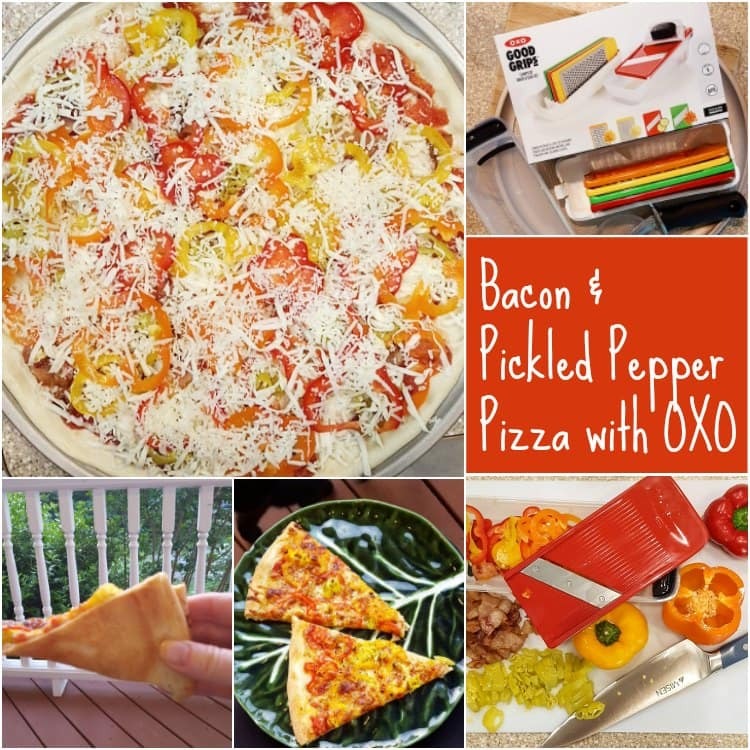 My friends at OXO sent me some of their products to help me make pizza so I can share it with you. Thanks, OXO! 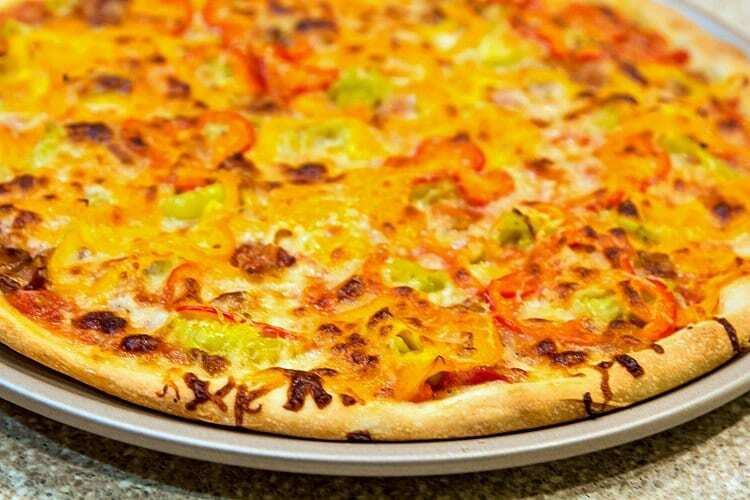 Are you ready for some Bacon and Pickled Pepper Pizza? I bet you are! 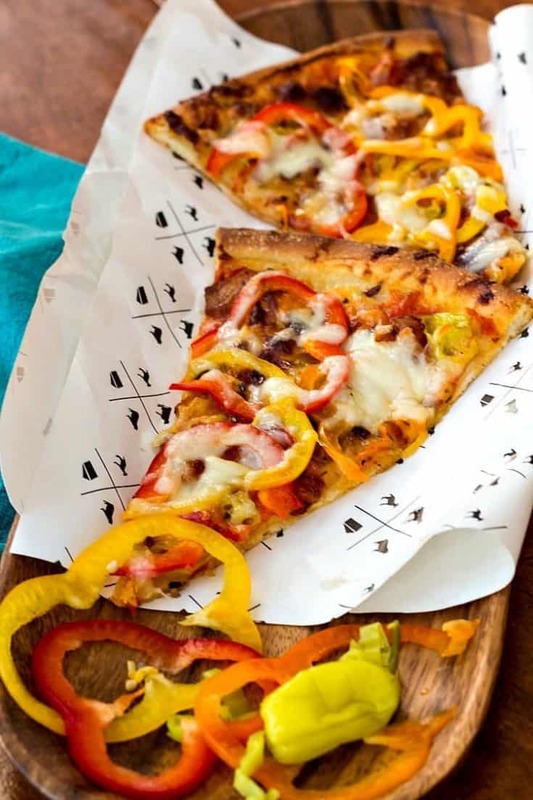 This Bacon and Pickled Pepper Pizza is the perfect warmer weather pizza. The sharp pickled peppers give a lightness to what can sometimes be a heavy dish. The bacon is there for some smoky accent and the occasional crisp/chewy bite, but you can absolutely leave it off or switch it out for other meats. Non-Stick Pro Pizza Pan: I have the OXO Non-Stick Pro 9″x13″ Cake Pan, so I had high expectations for the pizza pan. Still, pressing out and stretching the dough directly on the pan without benefit of cornmeal made me feel a little squidgy. I should not have worried. The pizza baked up like a champ and fairly slid off the pan. Plus, the pan allows you to make up to a respectable 15″ pizza. Complete Grate & Slice Set: A mandoline that stores neatly inside its plastic nest so you don’t get hurt. It comes with four different blade inserts: coarse and medium graters (which I consider more of medium and fine. They work best on harder cheeses. The block of mozzarella I grated created a lot of drag and I had to be very careful to keep the blade in place with one hand while grating with my other. 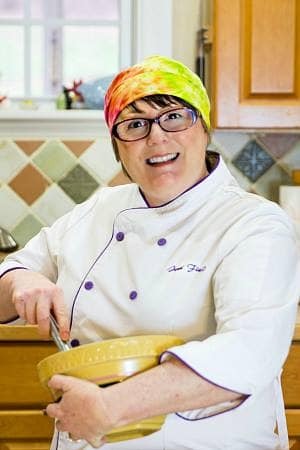 On the Romano cheese I used as garnish, they worked exactly how I expect a good grater to work), a straight slicing blade and a julienne slicer, which is a two-blade combo–a straight slicing blade coupled with a toothed blade. The julienne slicer is the only blade I didn’t use to make my pizza. The straight slicer works very well. You cannot adjust the thickness of the cuts, so all your slices will be very thin–1/8″ or even a bit less. This was no problem for my peppers, but you wouldn’t necessarily be able to use it on juicy fruits or vegetables like tomatoes. The blades are very sharp, which is great, and they do provide a toothed food pusher/hand guard deal meant to keep fingers separated from blades. The whole deal is dishwasher safe, which is an excellent feature, but do use caution when loading and unloading the dishwasher. All four blades and the pusher store neatly inside the lid, so even if you only use this infrequently, it doesn’t take up a bunch of space, and you won’t have to worry about inadvertently cutting yourself when reaching into the dark recesses of your cabinets. 4″ Pizza Wheel is made of clear plastic, and it won’t scratch your pizza pans. I was skeptical, but it actually made pretty clean slices. Not sure how well this one will hold up over time since the “blade” edge might get dull quickly. I usually move my pizzas to a cutting board for slicing, so I don’t mind using a metal slicer. For those of you who need to slice directly on the pan, this plastic number would be a good option, at least in the short term. 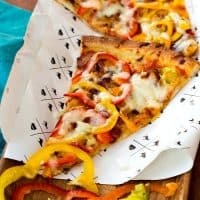 Bacon and Pickled Pepper Pizza is light, smoky, tangy, salty goodness. You're going to love it. Leave off the bacon to make it vegetarian. Grab the recipe for pickled peppers at the bottom of the post. Place the tomatoes in a medium-sized bowl and squish them up with your clean hands. You don't want any big chunks left, so be pretty thorough. By the time you get through smooshing up the tomatoes, they will be pretty wet. Give them a quick drain through a seive. They don't need to be completely dry, but get rid of most of the extra "soup," leaving just wet tomato bits. Add the rest of the ingredients. Stir to combine and let sit at room temperature for 30 minutes or so for the flavors to combine. Place a rack as close to the bottom of your oven as you can. If you have a pizza stone or pizza steel, put that on the rack. Preheat the oven to 500F. Press and stretch your pizza dough right on your OXO pizza pan. I promise it won't stick. Press it right out to the edges so you will end up with a nice, big pizza. Spread your homemade pizza sauce all over the dough to within about 1/2"-3/4" from the edge. This will be a very light layer, so don't be sad if your dough isn't thick with sauce. It will be okay. For a thicker crust, cover and let your pizza rest for 30 minutes or so. Otherwise, straight into the oven he goes. Bake for about 10 minutes, rotate the pan and bake an additional 5-10 minutes or until the bottom is golden brown and your cheese is nicely melted and starting to brown. If you want, you can carefully move the pizza to a higher rack and broil for 2-3 minutes to get the cheese and crust a bit browner. Totally your call. I garnish with some pepper flake, garlic powder, and Italian seasoning. You can, too, if you want. And there you have it. Pickled peppers for your bacon and pickled pepper pizza or for whatever else you can think of to do with them. And a pizza you will want to make over and over. Thanks again to my friends at OXO for the Pizza Making Treats! Pizza has always been my favorite, its everyone’s favorite basically. Never tried it with Bacon strips. Will definitely make it at home this weekend. Thanks Jenni. I agree, Philip–pizza is the best! I loved the combo of bacon and pickled peppers, but there is never a wrong time for bacon! lol If you happen to have some Canadian bacon, that would work as well! Enjoy!